22 Jun Is Your Linen Closet Full? Sometimes storage closets seem to have a life all of their own. Sooner or later, we need to declutter, throw out and re-invent the storage space. Today, we’re going to help you with your Linen closet. First of all, it’s time to go through all of the items in your linen closet. I know you all have too many towels, face cloths and bed sheets. They all seem to gather after a while . 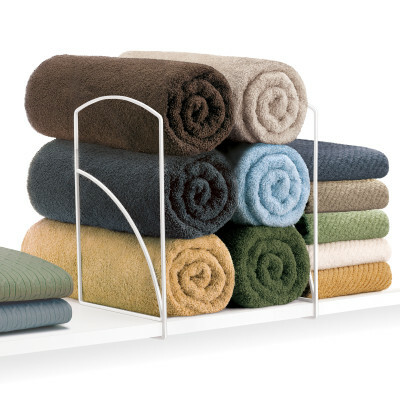 My suggestion is to keep as many towels and face cloths so that you have at least one for every day of the week. Most of us do laundry once a week anways so you’ll have at least a few clean ones to work with. As for sheets, you only really need two to three sets per bed, one of them being a fuzzy flanelette. Now for anything else in your linen closet, consider what you want stored in here. 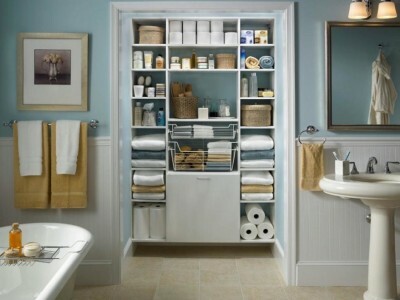 Do you use this as an overstock location for bathroom supplies ie toilet paper, shampoos and other cleaning materials? Now is the time to figure out exactly how you want to use this linen closet. For storing towels, sheets and face cloths, I find it is so much easier to have your shelves created with solid dividers. Not only does it keep tall piles of them from falling over, but I find the lining up of square areas seem to give the look of order and neatness. For toiletries that you may store in your linen closet, whether it is shampoo or other bottled items, I find it is best to treat them like you would kitchen food stuffs: put them in a pull-out drawer. Not only do pull-out drawers give you an instant view of everything in that space but also allows so much easier access to the entire space without having to move things around endlessly to get those items in the back. Large bulky items, such as toilet paper, paper towels and comforters, it’s easiest to put these in large uniform baskets. The baskets will house them neatly and give the appearance of a simple neat look. I know this all sounds like a lot of work but in the end, you will have a much neater space and more than enough room to store everything. 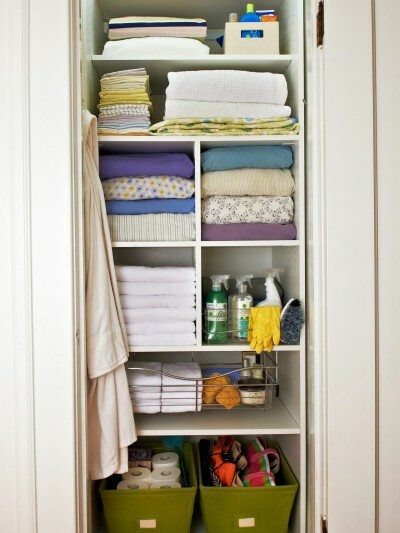 For cleaning supplies, if you store them in your linen closet, keep them separate and not as visible since they are not used as often as every day items such as towels and toiletries. Consider hanging up the broom and smaller cleaning supplies on the door of the linen closet. As for the vaccum, I store mine in the linen closet in a space just a little taller than the actual the vaccum. I keep sheets and pillow cases together since I change the sheets and pillow cases all at once anyways. Another manner in which to get the appearance of uniformity in your linen closet is to consider going with a single colour palette. If your sheets, towels and face cloths are all the same colour, your linen closet won’t seem like a jumble of different styles and colours but seem cohesive.